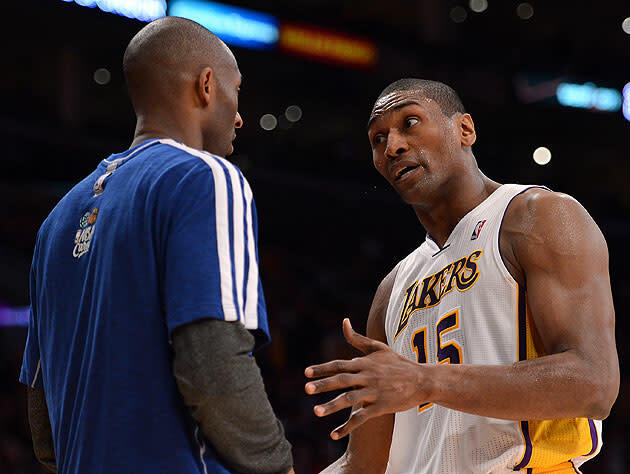 Compared to superstar teammates Kobe Bryant (who's spoken and typed loudly, publicly and often) and Dwight Howard (who's also spoken loudly, including, allegedly, in private), it's been a relatively quiet season for Los Angeles Lakers forward Metta World Peace. I mean, sure, he's gotten suspended for kind-of punching the Detroit Pistons' Brandon Knight, gone into the stands to kiss a woman's hand after a dunk, begun working on a TV prank show and addressed the LAPD in Cookie Monster pajamas, but, y'know, that's it. Pretty standard stuff, and it's been mostly quiet besides. But while his own actions have taken a backseat to larger Hollywood dramas this Lakers season, World Peace's words still contain multitudes, if you listen carefully and organize them properly. Luckily, Jeff Parker — an author, director of the University of Tampa's creative writing MFA program and sports fan — is just such a listener and quote curator, and has transformed World Peace's postgame musings into a cut-and-paste piece of poetry entitled "Erratic Fire, Erratic Passion." I don’t shake substitutions’ hands. I’d like to thank my psychiatrist. But I didn’t know it was an actual head. I knew somebody suffered something at that point. There were a lot of emotions in that game. I have to try to get the ball. Kobe passed me the ball. Kobe never passed me the ball. So you can just hear him in your head. And bam! I shot it. From the infamous dismissal of James Harden before their first meeting after the elbow heard 'round the world to his explanation of the physicality of an altercation with Harden's then-teammate Russell Westbrook to the soaring heights of a post-NBA title-winning appreciation of his mental health professional, all in three lines. You can take great leaps and bounds in a very brief period when you go inside the words of Metta World Peace. I don't have an especially finely tuned eye or ear for poetry, so I'm probably not the best authority on whether or not this is, strictly speaking, "good." But I'm betting any reader of our site's likely to enjoy it immensely, and that those inclined to listen closely and stare hard enough at both the lines themselves and the spaces between them will find themselves feeling like they understand MWP just a little bit better (such as anyone can really understand him, anyway) ... and maybe even come to a slightly sharper understanding of themselves. Or, y'know, just enjoy remembering all the funny things he's said over the years and hope Parker's got the time and inclination to offer up a second set of stanzas in the near future. While we're waiting, I guess we'll just have to make do with Metta-authored rhymes like those penned on "Point of No Return," his new and obviously NSFW rap single with hip-hop veteran Tech-N9ne, which features the former Ron Artest doing a bit of Auto-Tuned singing around his bars. ... On second thought, maybe just re-read the poem. Hat-tips to the New York Daily News' Page Views blog and old pal Rob Mahoney at The Point Forward.